Are Your Kids Ready for a Pet? A Pet Means Responsibility, Are They up for It? Have your kids been nagging you nonstop about getting a pet? Do they beg and cry and pout, hoping you will finally cave in? If so, it may be time to consider whether or not your kids are ready for a pet. Adding a furry or feathered member to the family is no small consideration. A pet is a living, breathing creature and has to be cared for. Even if you consider the pet to be your child’s, you will undoubtedly also have to care for it as well. So how do you decide whether your kids are ready to play the role of animal caretaker? Consider if they display the following characteristics, which will also measure their level of commitment to caring for a pet. It may seem like a no-brainer, but whether or not your children do their chores is a sure sign of their readiness to have a pet. If you constantly have to remind them to take out the trash, put away dishes, or set the table, it’s likely they won’t take their pet chores seriously either. Pay special attention to the way they care for themselves. If your children neglect personal hygiene, for example not brushing their teeth or hair or washing their face, they may not be ready to care for another living thing. On the other hand, if they take initiative and do things around the house without being asked to, they’re likely mature enough to handle the many responsibilities that come with owning a pet. As with any job or caretaker role, owning a pet has a unique set of responsibilities. If your kids want a pet, educate them on what that will entail. What would daily life be like in the household with a pet around? Discuss feeding and grooming schedules, playtime, where they’ll do their business and how to clean it. If they seem overwhelmed or put off by the tasks, you may want to rethink getting them a pet. You may also want to inform your kids about how much time they’ll need to dedicate to their animal and what being neglectful can mean for a living thing. If a dog is in the cards, ensure they understand the needs and qualities of the specific breed they want. Some dogs require more exercise than others, so if your children would rather play video games than go outdoors, breeds like sheepdogs, Dalmatians and shepherds may not be the best match. Pay attention to how comfortable your kids are around animals. If they want a dog or cat, have they socialized with friends and family members’ animals? Do they know where to pet an animal so it won’t bite or how to recognize when an animal doesn’t like something they’re doing? Smaller children especially are prone to making mistakes around animals, as they may want to treat them like they do their stuffed animals. Even though cats and dogs are domesticated, they still have animal instincts that will kick in if they feel threatened or bothered. The last thing you want is to get an animal only to have it bite or injure your child because they were handling it incorrectly or provoking it. Often, this can lead to trauma and a lifelong fear or dislike of that kind of animal. Take precautionary measures and make sure your children will safely engage with the animal before you commit to bringing one into your home. 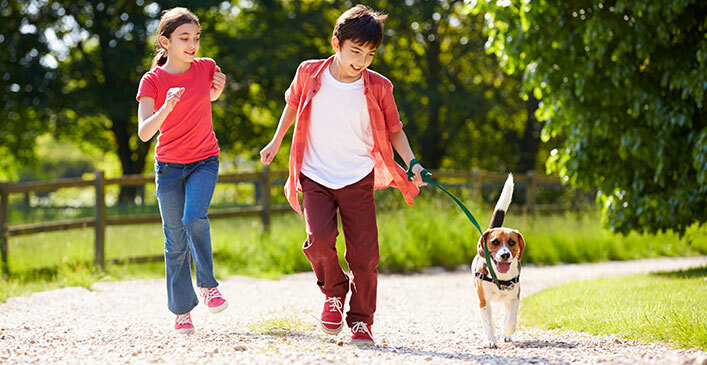 Have your kids seriously considered everything that goes along with having a pet? Have you gone over the pros and cons of ownership with them and they still want the animal? Have they promised to take care of it no matter what? Only after discussing it in-depth with them can you really make a decision on whether to get a pet. One way to find out their level of commitment is to ask them why they want the animal and how they intend to care for it. If they bring up valid reasons and examples of their plans for responsibility, they have probably given it enough thought. Even if you believe they are really ready, give it more time to sink in. Kids are impulsive and want things all the time, but often get bored with something, including a pet, after a few months. If the kids have been asking for a puppy for longer than a few months, or even years, demonstrate responsibility, and are used to animals, it’s likely they are indeed ready for a pet.